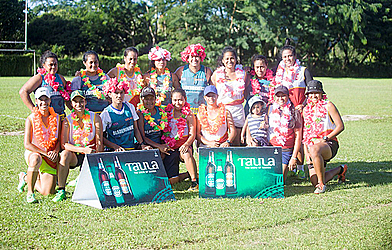 The Samoa Touch Rugby Inc. (STRI) hosted its finals for the Touch the Crown Opens Tournament, sponsored by Taula Beverage Company last Saturday at the St Joseph’s College grounds at Alafua. After 10 weeks of competitive pool games and playoffs, the finals came down to four core clubs for the Men’s, Women’s and Mix Divisions – Marist, Meitaki, Bladerunners and No Idea. Defending champions of the Men’s division, Marist Saintz faced off against a strong Meitaki team in a thrilling final that went into drop off. Meitaki started the final strong but the experience of the Marist Saintz enabled them to end the game with a win 8-7 and reclaiming their title for the third consecutive year as Opens Men’s champions for 2018. The Women’s division title was battled out between No Idea and Bladerunners, another spectacular game that resulted in No Idea overcoming the Bladerunners 4-2. As part of the STRI Strategic Plan, STRI has strived to encourage more female participation in touch rugby and this has been evident with an increase of teams in the Women division from 3 teams in 2017 to 7 teams participating this year. The final event for the Touch the Crown Opens finals was the Mix Division final between Marist Family and Meitaki – following the nail biting final between both clubs in the Men’s final, it was expected to be another tough game. With both teams displaying great speed and talent during the match, it was a neck and neck game but Marist Family hung on to claim the title with the final score 6-5. During the prizegiving, the awards were presented by Faimalomatumua Mathew Lemisio (Marist St Joseph Sports Club President), Alberto Schreiber (Taula Beverage Company Sales Representative) and Lemauga Hobart Vaai (STRI Past President). In commemoration of Mother’s Day, the Women’s division final was dedicated as the ‘Mother’s Day Match’ for all the mothers in the touch rugby community, recognizing their contribution to the sport and celebrating the mothers who participate as players, coaches and supporters. STRI would like to thank all participating teams as well as our sponsor Taula Beverage Company and Br. Iulio Suaesi, Principal Susitina Levao and Asolelei Tolovae of St Joseph’s College for their support and hosting our tournament at the SJC grounds at Alafua.